Dr. Rebecca White is excited to be adding acupuncture therapies to our services. She has graduated from the TCVM (Traditional Chinese Veterinary Medicine) equine basic course at the Chi Institute in Reddick, FL. The following are some frequently asked questions about TCVM, if you have any other questions about our acupuncture services, or to schedule an appointment for your animal please contact our office. Acupuncture usually involves the insertion of thin sterile needles into discrete, specific points on the body to cause a therapeutic effect. Other methods are sometimes used, like electroacupuncture (electro-stimulation of the acupuncture points), moxibustion (burning a specific substance called moxa to stimulate a point and cause a warming effect), and aquacupuncture (injection of substances, like: vitamin B12, sterile saline, or the patient’s own blood into an acupoint). How long has acupuncture existed as a medical treatment modality? Acupuncture has been practiced in both animals and humans for thousands of years in China. The earliest veterinary acupuncture text book is believed to have been written as early as 659 B.C.E; since that time acupuncture has been a part of the mainstream veterinary medical system in China. What is the scientific evidence to show how acupuncture works? As of early 2017, there are over 25,000 research papers looking at acupuncture as it pertains to veterinary medicine in the US National Institutes of Health’s National Library of Medicine (WWW.pubmed.gov). Current literature shows that acupoints are areas where there is a high density of nerve endings, mast cells, small arterioles, and lymphatic vessels. Many studies indicate that the stimulation of acupoints induces the release of beta-endorphins, serotonin, and other neurotransmitters. Acupuncture is a very safe procedure when administered by a qualified practitioner. There have been very few negative effects of acupuncture therapy found in clinical studies. Treatment sessions can take up to 45 minutes. The first session usually takes longer than follow-up appointments. 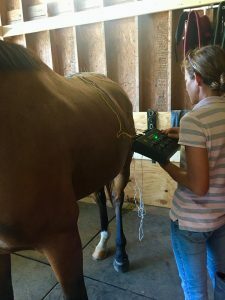 How soon should I expect to see results from my animal’s acupuncture treatment? In some cases, results can be seen immediately, but others require several treatments. Generally, a minimum of 3-5 treatments 1-2 weeks apart for chronic conditions are needed before notable improvement can be seen. Acupuncture is generally not painful due to the small need size used. Due to the relaxation effect, some animals will fall asleep during acupuncture treatments. 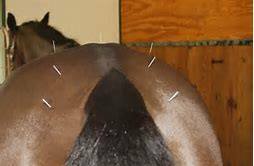 Only licensed veterinarians are qualified to practice veterinary acupuncture in most states in the US. What types of conditions tend to respond well to acupuncture? Musculoskeletal Problems: muscle pain, back pain, arthritis, etc. Neurologic Disorders: seizures, disc disease (IVDD), laryngeal hemiplegia, facial and radial nerve paralysis. G.I. Disorders: diarrhea, gastric ulcers, colic, constipation/impactions. Other Chronic Conditions: skin issues, asthma, uveitis, behavior problems, Cushing’s disease, geriatric weakness, anhidrosis, etc. Are there any cautions/contraindications of acupuncture therapy? Caution should be used in the following conditions: fractures, pregnancy, and open wounds and tumors. Please contact our office for more information or to schedule your animal’s chiropractic appointment.